XperiFirm Tool makes the tedious task of manually searching and downloading stock Sony Xperia firmware easy. Xperifirm downloads Sony firmware from official servers and there is no chance of firmware being corrupted. 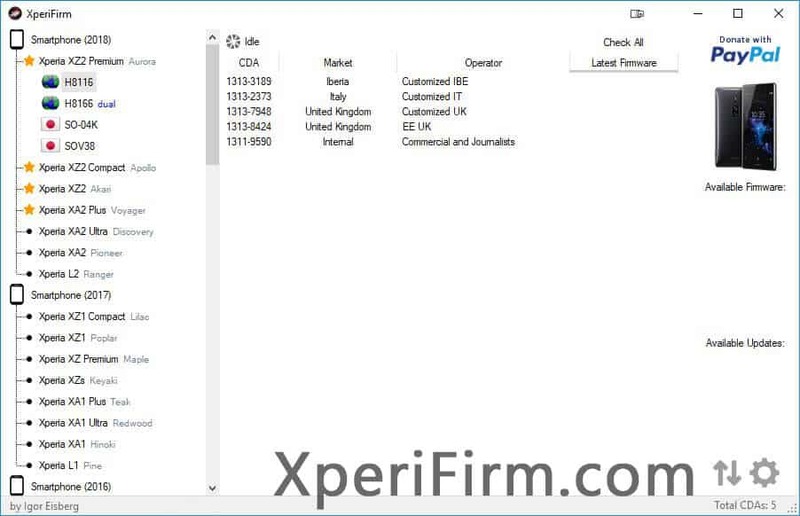 Here on this page, you can download Xperifirm v4.8.1 for Windows 10/7/8/8.1, Linux and Mac. FIX: This should solve the occasional "Failed to connect to the server." error appearing randomly when opening XperiFirm. Below you can download Xperifirm v4.8.1 for Windows, Linux and Mac. To use it on Linux and Mac, install Mono on your system (instructions provided below). Xperifirm requires .Net Framework and Sony USB Drivers installed on a Windows PC. Below is the information on which .Net Framework version required depending on the Windows version you are running. Xperifirm Tool can be used on Linux systems with the help of Mono. Complete instructions on how to install Mono and how to use Xperifirm Tool on Linux are provided here. Similar to Linux System, Mac also requires Mono to run Xperifirm. Complete instructions on how to install Mono on Mac and using Xperifirm on Mac are provided here. [*] Sony USB Drivers: It is required that you have proper Sony USB Driver installed on your Computer. This allows Xperifirm Tool to detect the device and download the suitable firmware. [*] Take Backup First: Before flashing the downloaded stock Sony firmware using Sony Mobile Flasher, it is recommended to take a complete backup of your data. [*] Always Scan First: We have scanned XperiFirm_4.8.1_(by_Igor_Eisberg).zip before sharing it here. However, we still recommend you to scan the file before using. Copyright © 2019 - XperiFirm | All Rights Reserved.